I have lived in Letcher County all my life, Joe and I moved from McRoberts to Ermine in 1991. We have been blessed with two wonderful daughters; Dedra and Joanna, both whom have graduated from Jenkins as well. I currently teach fourth grade at the Burdine Elem. Campus. Most everyone called me "Lisa" in high school. Leslie Fleming Burke has a birthday today. 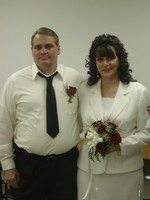 Renewing our vows on our 25th Anniversary. Joanna and Dedra, my gifts from God! Lisa and Joe "old school"
Jimmy Owens; one of our favorite drivers. With Jimmy Owens at Volunteer Speedway TN.